Did you know that only 20% of people stick with their New Year’s resolutions until February? If you’re one of the many Americans who dreams of attaining a slimmer body, you’ve probably tried all kinds of diets. The key to sustainable weight loss is to turn your efforts into a lifestyle. Healthy foods don’t have to be boring! Here are 10 simple meal prep recipes that taste incredible and help you accomplish your fitness goals. The biggest mistake dieters make while trying to lose weight is skipping breakfast. When you don’t give your body fuel when it wakes up, you’ll try to overcompensate at lunchtime by binging. These banana and chocolate oatmeal cups are decadent without the guilt. Oats are a great source of fiber and protein that will keep you full. The sweetness from the bananas makes this breakfast taste like dessert. As long as you don’t overdo it on the chocolate chips, the small amount of fat can help you stay satisfied. Most Americans don’t eat the recommended values of fruits and vegetables. Smoothies are a great way to gently wake up your digestive system. The creamy, sweet fruits make it easy to sneak in nutrient-dense vegetables without being able to taste them. Try these easy freezer smoothie packs that can be blended into a smoothie in one minute. Quinoa is a superfood because it’s a protein-packed grain. Cashews are another health food filled with fats that keep your stomach full and your heart happy. Chicken is a lean source of protein that can be transformed with tons of exciting flavors. This cashew chicken quinoa bake has the best of all worlds. It’s so hearty and decadent that you won’t believe it’s great for you. Who doesn’t love Tex-Mex fast food joints like Chipotle or Moe’s? Although these chains offer more healthy alternatives than American fast food joints, they’re still loaded with unnecessary fats and sodium. The good news is that you don’t have to give up your beloved burrito bowls while you’re on a diet. 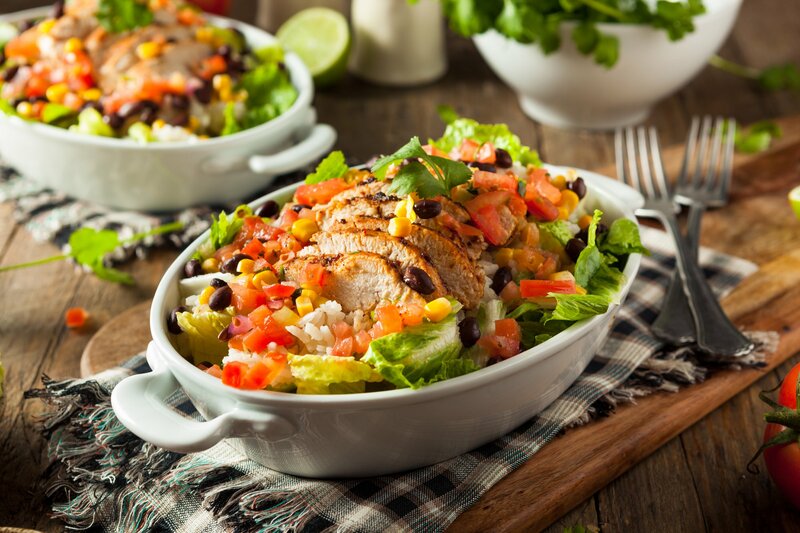 When you make these chicken burrito bowls at home, you’re in control of what ingredients go into them. This recipe is fresh, satisfying, and full of flavor. One common complaint about meal prepping is that the food doesn’t taste as good by the end of the week. Thanks to crock pots, you can still take advantage of the ease of meal prepping and still get fresh meals. This sesame chicken soup can be prepared ahead of time and frozen in a bag. All you have to do is dump the ingredients into your crockpot with some broth and let it cook while you’re at work. Veganism is a growing trend that has helped many people lose weight. Since plants are nutrient-dense and contain fewer calories than animal products, you can eat a lot of food and stay slim. This Mexican pasta salad is rich thanks to a cashew cream full of warming spices. The inclusion of plant-based bacon makes this recipe taste sinful, but you won’t put on any weight. We all adore Chinese takeout, but American-Chinese cuisine is one of the worst culprits for fat gain. When you make your own Chinese food at home, you can avoid the harmful MSG and deep frying. This beef and broccoli recipe tastes like the real thing. The best part is you don’t have to suffer from the bloated, tired feeling you get after eating traditional takeout. Beans are one of the healthiest foods you could eat. They’re full of protein, fiber, and iron. If you’re a woman, eating beans regularly can help you avoid anemia caused by your menstrual cycle. Chili is a comfort food, but it’s easy to go overboard with fats by adding cheese, beef, and sour cream. This vegetarian chili recipe will satisfy your cravings for comfort food without bogging you down. Instead of piling on unhealthy animals fats in your bowl, try garnishing with some heart-healthy avocado instead. Asia has some of the slimmest people in the world. Their diet consists of lots of vegetables, rice, and healthy protein sources like tofu. This Thai coconut quinoa bowl is full of so many unique, complex flavors that you’ll never be more excited to be on a diet. The purple cabbage slaw is tangy, sweet, and spicy. The peanut dressing is hearty and satisfying. Since this recipe is loaded with lots of vegetables like sweet potato, carrots, bell pepper, and cabbage, you’re sure to fuel your body with lots of vitamins it needs to feel its best. The edamame is an exciting crunch that boasts an impressive amount of plant protein. Along with the Asian diet, Mediterranean people are also accredited with having a healthy cuisine. The Mediterranean like to flavor their food with fresh vegetables and herbs instead of relying on salt and hydrogenated oils. They also stay fuller for longer by adding a small amount of healthy fats from nuts and olive oil. This Greek chicken bowl is made with lean chicken breast, slow-burning brown rice, and filling Greek yogurt. The tzatizki is tangy and fresh. The cucumber salad is flavorful and light. When you get a bite of every ingredient, your tastebuds won’t believe this meal is healthy. Ready to Get Your Dream Body? One of the best ways to stick with your New Year’s fitness resolutions is to plan ahead with simple meal prep recipes. These 10 tasty recipes will save time, help you lose weight, and keep you satisfied. If you want guaranteed results, then you need to join the ChiroThin Weight Loss Program. Unlike fad diets, this regimen is doctor supervised. If you’re ready to get lasting, healthy results, then find a ChiroThin doctor near you to start your journey.